Pizzetta - It took me several years before I ventured inside this place. Why would I go to a pizza restaurant in Spain? I want cochinillo, cordero or paella! This place kept getting mentioned by our guests in the guest book so one year we gave it a go. We have been several times a year since. The setting is fantastic, with a lovely garden, well designed so every table feels like you’re under an olive tree. The indoor area feels seamless with the outdoor area and the lighting is fantastic. We tend to go relatively early evening with the kids and in the Summer as the sun sets the whole place is filled with beautiful warm light. The food is great, the pizzas are cooked to perfection in a wood fired oven. Try the gambas al ajillo pizza for a great twist on Spain meets Italy. I almost always have the same, the salmon and tuna sashimi followed by fillet steak with foie gras washed down with a bottle of Pesquera, a fantastic red from Ribera del Duero. Where else in the world can you enjoy a meal like that in a beautiful setting while the kids enjoy their pizzas? Hotel Aigua Clara - This hotel is on the way into town from the Villas. It has been owned by the same people since we bought Villa Begur, a delightful couple called Joan and Clara. They used to rent out the restaurant but for the last few years they have been running it themselves and doing a really good job of it. 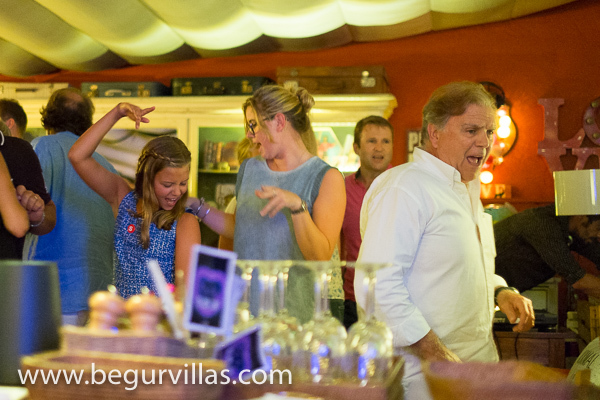 Out favourite night is the vinyl DJ night, tourists and locals of every age group go and enjoy the great 60s-80s music in the beautiful garden of the Cuban style colonial house and garden The food is great and reasonably priced, the gin and tonics are HUGE and delicious. It never takes long for everybody to leave their seat and strut their stuff on the dance floor. It is always a memorable evening. Sa Riera Beach - Es Bas - This is our favourite place for lunch. Es Bas is a small hotel that also runs the main restaurant on the beach. It is the typical, but good quality, Spanish sea side food. We tend to get a couple of tables, adults on one, kids on the other and order a variety of tapas maybe followed by a paella to share. Our favourite tapas there are the calamares (squid), chipirones (tiny squid), sardinas (sardines), gambas de palamos (local prawns, more about these later), pan con tomate (bread with tomato), a couple of salads lubricated with a bottle of the Torres de Casta, a delicious and cheap rose. The wonderful waiter, Santi, usually brings us some delicious local digestifs after the meal which makes the walk around to the side beach slightly wobbly! As our lunches are late and somewhat long we tend to get to the (not so) secret side beach as others are leaving, just in time for the best time of day there when the sun is not so hot, the shadows are long and the water is still refreshing. The restaurant is also a lovely place to visit in the evening, go for the jazz night when you can enjoy delicious whole monkfish with the sound of waves and jazz tingling in your ears. Tamariu beach - Es Dofi -This is the last restaurant along the promenade in Tamariu and in our view the best. The food is similar to Sa Riera and, if anything, a little bit better with a bigger selection of dishes. Their almejas (clams) and pulpo (octopus) are particularly good. They do not take bookings so we tend to arrive before lunch, tell them we would like a table and play on the beach for a bit until it’s ready. The best thing about the local food is the quality of ingredients, vegetables are weird shapes and sizes and actually taste of something, unlike the plastic wrapped perfectly shaped but tasteless rubbish we get in the UK. Green peppers, slowly fried in olive oil with salt, are amazing and incredibly easy to prepare. For meat we tend to go to one of the excellent butchers in town or to the one at the back of the Jodofi Supermarket in the outskirts of town (by Camping Begur on the way to Tamariu). Spanish lamb and pork are both excellent whereas I prefer British beef so I tend to not buy it in Spain. For the barbecue try costillas the cordero (tiny lamb chops) or secreto iberico (the iberico secret, a cut I have not been able to find in the UK, it looks horrible and fatty but when barbecued it all melts away to leave a tender and delicious pork steak). The fish monger in town opens twice a day, once in the evening and once at 7.30pm. I usually volunteer to go up in the evening and buy the fish for supper while maybe grabbing a quick beer with a mate. The gambas de palamos (local prawns) are amazing. I have no idea if they are a different species or if it something in the local water that makes them so delicious but they are completely different to other prawns, sweeter and softer and they release a rich and aromatic dip for fresh bread. Yes they are expensive but it is worth pointing out that the small ones taste just as good as the big ones and they are a lot cheaper. We tend to go for the medium ones that are about €25-€30 a kilo and worth every penny. The fish monger outside Jodofi (the supermarket next to Camping Begur) is also very good and the parking is easier. Our favourite barbecue starter is done on the large paella pan on the barbecue, gambas de palamos (local prawns), mejillones de roca (rock mussels) and almejas (clams). Leave each of the three ingredients in their third of the paella pan and simply cook wth some olive oil on the barbecue, like James Bond’s martini this dish is best shaken, not stirred. They need nothing but a bit of salt for the most delicious starter, from the sea to the roof terrace in a few hours, amazing. 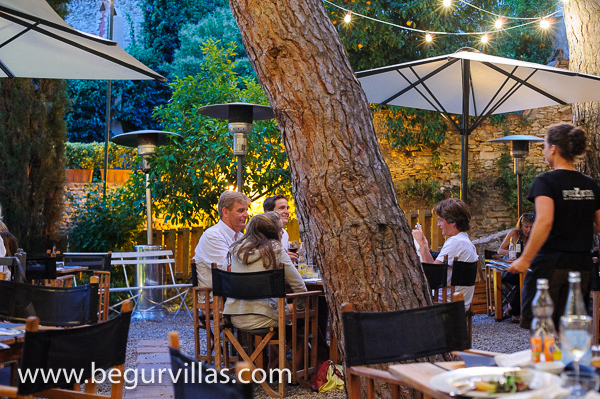 There are, of course, many amazing restaurants in Begur and I have barely touched the surface of the local food available, but I hope I have done enough to give you a taste of what a trip to either Villa Begur or Villa Sa Riera will bring for the taste buds.